No toll please state when asked. We have free available parking directly outside our studio – please look for our customer parking signs. At the roundabout with the "Broadway" pub on the left hand side – continue forward and take the exit after the traffic lights to Darley Abbey – head down Mileash Lane. Follow Mileash Lane through onto Abbey Lane, then turn right at Old Lane when you see "friar gate" framers. Continue to follow the road round, over the bridge. You'll need to drive straight past our building and turn back into the car park and there we are! Turn left onto Church Lane and then turn left again at Old Lane when you see "Friar Gate" framers. Follow forward, past the rugby club on the left hand side. 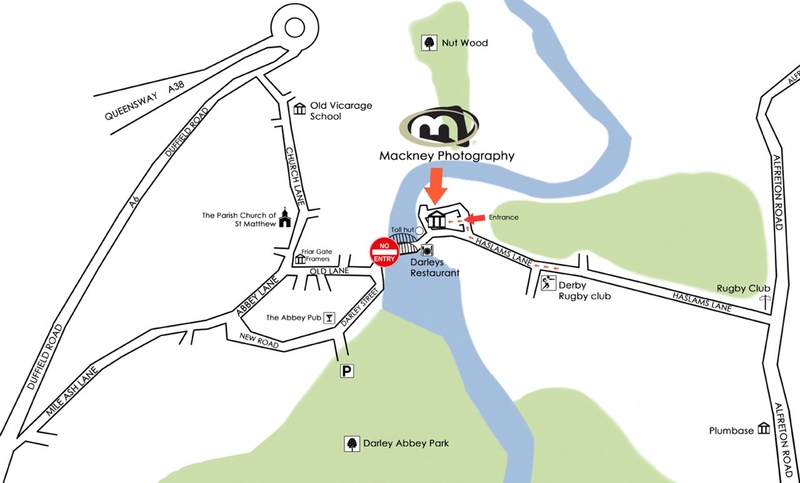 You'll drive into Darley Abbey Mills – follow the map and there we are!